Return to Archives. 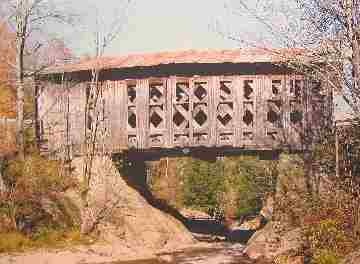 Hectorville Covered Bridge Removed. Montgomery, Aug. 22, 2003 - Montgomery holds bragging rights as the Vermont town with the most covered bridges, boasting six inside the town limits and one on our border, the most of any town in the State, country, and, as some claim, the world. As recently as the 1940s there were thirteen in use here. Most were built by Savannah and Sheldon Jewett, from the 1860s to the 1890s. But with bragging rights also comes obligations and costs, and since two of the town's bridges no longer serve vehicular traffic (the Hectorville or Gibou Bridge, and the Creamery or West Hill Bridge) , the costs associated with their upkeep and renovation fall to the town's approximately 900 taxpayers. These costs compete with all other municipal needs; schools, water, roads etc., so it's not surprising the condition of these two bridges has deteriorated over time. A couple of years ago the Montgomery Historical Society took the initiative to hire an engineer to study these two bridges and develop recommendations on what the town should do. Of the two, the engineer said the Hectorville Bridge was in the worst shape and would likely fall into the South Branch of the Trout River if it wasn't taken down before last winter. The Historical Society made a recommendation to the Selectboard and with generous support raised the funds necessary to disassemble the bridge and put it into storage until it's fate could be determined. The Hectorville Bridge is now resting in the yard of St. Onge Construction and seems to be the object of curiosity and amusement as many still stop and take its picture. In the meantime a group of townspeople has been charged by the Selectboard to recommend where the bridge should be placed and provide a cost estimate for the project. This group has been meeting since May and is building on work by a similar ad hoc group formed by the Historical Society that worked through the winter. Options under consideration are to repair the bridge and return it to the Hectorville site on the Gibou Road, or to repair the bridge and relocate it to an area of town that would integrate it into a recreation path. (Of note this bridge was originally located in Montgomery Village and was moved to the Hectorville site in the early 1900s). Of these options, the latter has garnered the most enthusiasm on the committee because it could put the bridge in plain view on a main thoroughfare and make it eligible for several State and Federal programs related to recreational use, easing the financial burden on the taxpayers.